How often does a fabulous favor come along that is environmentally friendly, delights guests and helps improve the lives of millions? The ivory-lined pink ribbon is embedded with wildflower seeds that, when planted, blossom into a glorious garden of brightly colored wildflowers your guests are sure to enjoy. This symbolic plantable is a lovely start for a garden in honor of�or in memory of�a loved one touched by breast cancer. 10% of the net proceeds from the sale of our Pink Ribbon favors benefit The Young Survival Coalition, an international charity dedicated to improving the lives of young women living with breast cancer. 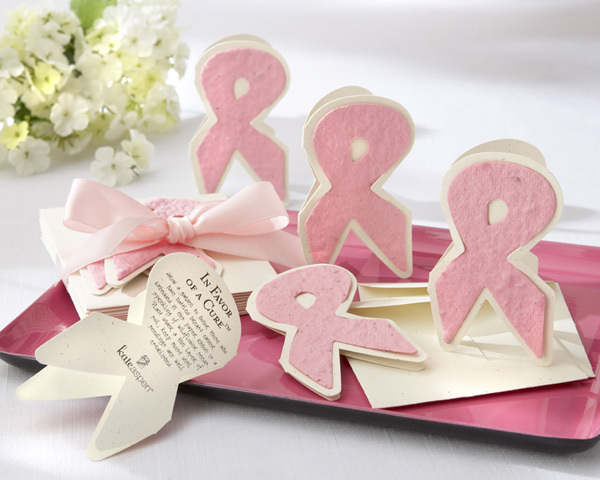 If you want to make lasting memories for your guest the Pink Ribbon Plantable Favor is all you need. The ribbon favor measures 2 �� x 1 ��, and the cream-colored envelopes are included. Sold in sets of 12 favors.